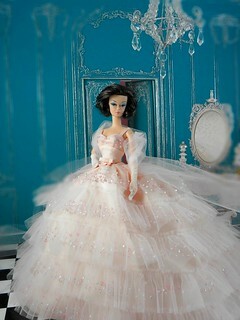 There is a talented artist in Russia from whom I ordered a beautiful Barbie outfit. Her Etsy shop is Rebecca Fashions. I also follow her Flickr photostream. You can also find her creations on Ebay. The dress I ordered has a meticulous fit and is very well made. I was completely smitten with this dress when I first saw pictures of it, so I was over the moon appreciative when I found out it was available for special order. 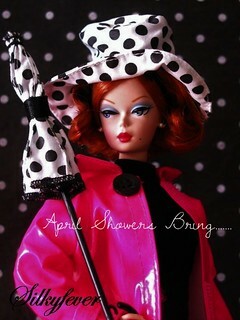 I can never say no to a pillbox hat for Barbie, especially one with a tulle net. Pair it with a classic ’60’s flip hair style and it is the **perfect** combination. 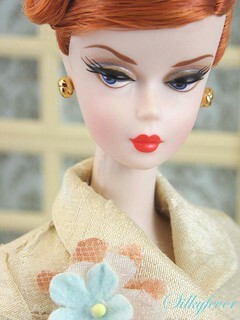 I was inspired to dress Hollywood Bound Silkstone Barbie in this lovely fashion (does she not sport the quintessential 1960’s flip?!). For my back drop I wanted to feature the fun storefront I received at the 2012 National Barbie Convention. This was a table centerpiece that I was fortunate enough to be drawn to win. 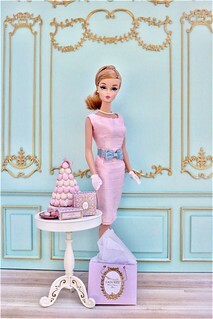 Whenever I display a Barbie in front of the storefront in my doll room, I immediately get that “Window Shopper” vibe.